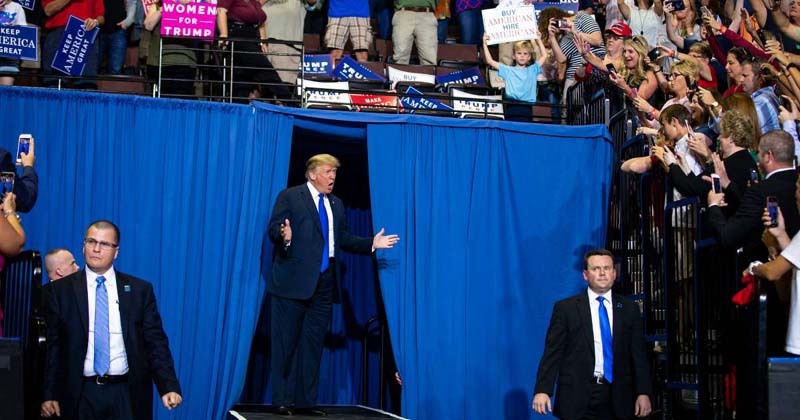 Mr. Trump delivered a scathing and derisive impression of Dr. Blasey during a campaign rally in Southaven, Miss., on Tuesday night. For more than two weeks he held back. Against all his instincts, President Trump for the most part resisted directly attacking the woman whose sexual assault allegation has jeopardized his Supreme Court nomination. The accuser was to be treated with kid gloves, like “a Fabergé egg,” as one adviser put it. But Mr. Trump could resist only so long and told aides it was time to turn up the heat. So when he revved up a political rally this week by mocking Christine Blasey Ford, he indulged his desire to fight back and galvanized his conservative base even at the risk of alienating the very moderate Republicans he needs to confirm Judge Brett M. Kavanaugh to the Supreme Court. The president’s scathing and derisive impression of Dr. Blasey, who has accused Judge Kavanaugh of sexually assaulting her when they were teenagers, came at the same time his Republican allies stepped up their efforts to challenge her veracity. Seizing on a sworn statement from a former boyfriend, Republicans suggested that she had not been fully truthful in her testimony before the Senate Judiciary Committee last week. Even some of the president’s strongest supporters called his attack on Dr. Blasey counterproductive, including Senator Lindsey Graham, Republican of South Carolina and Judge Kavanaugh’s most outspoken supporter, and the hosts of “Fox & Friends,” the president’s favorite morning television program. “I would tell him, ‘Knock it off; you’re not helping,’” Mr. Graham said at the Atlantic Festival in Washington. The more aggressive attack on Dr. Blasey’s credibility came after Democrats had spent days picking apart Judge Kavanaugh’s testimony, looking for contradictions to undercut his denials that he ever mistreated women while drunk in high school and college. On Wednesday, Senate Democrats escalated their attack by suggesting there was undisclosed evidence of inappropriate behavior by Judge Kavanaugh in prior F.B.I. background checks for previous positions. New polls released on Wednesday showed that Dr. Blasey fared better with the public than Judge Kavanaugh did during last week’s hearing. In a survey for NPR, PBS and Marist College, 45 percent of Americans said they believed she was telling the truth, while 33 percent said he was. Forty-one percent of those who responded to Reuters and Ipsos opposed his confirmation, while 33 percent supported it. That was the opposite of what happened after Clarence Thomas was accused of sexual harassment by Anita F. Hill during his 1991 confirmation hearings, when polls showed more Americans believed him than her. The disparate results reflect the changing national attitude toward sexual misconduct in the #MeToo era when the public has been more receptive to women coming forward with allegations. With midterm elections less than five weeks away, that has immediate consequences for Mr. Trump and the Republicans. The Cook Political Report, which tracks congressional races, shifted eight more Republican-held House seats on Wednesday in the direction of Democrats as “the Kavanaugh debate further polarizes voters into red and blue corners.” Still, the NPR/PBS NewsHour/Marist poll found that Republicans were more energized about the election than before, possibly owing to the Supreme Court fight. White House officials insisted on Wednesday that the president was not mocking Dr. Blasey but “stating the facts,” as Sarah Huckabee Sanders, the White House press secretary, put it. She expressed indignation at the idea that Judge Kavanaugh’s credibility could be questioned but not Dr. Blasey’s. Kellyanne Conway, the president’s counselor who recently said she too was a victim of sexual assault, insisted that Mr. Trump was not attacking Dr. Blasey. At the same time, Senator Charles E. Grassley, Republican of Iowa and chairman of the Judiciary Committee, confronted Dr. Blasey’s lawyers with a sworn statement from a former boyfriend challenging some of her testimony. But the former boyfriend, who was identified by a person briefed on the matter as Brian Merrick, told the committee that when they were dating in the 1990s he witnessed Dr. Blasey helping a friend, Monica L. McLean, prepare for a possible polygraph examination while applying for positions with the F.B.I. or federal prosecutor’s office. Ms. McLean, now a former F.B.I. agent, denied the assertion on Wednesday. “I have never had Christine Blasey Ford, or anybody else, prepare me, or provide any other type of assistance whatsoever in connection with any polygraph exam I have taken at any time,” she said in a statement. In his statement, Mr. Merrick said he first met Dr. Blasey in 1989 or 1990 in California and after a period of friendship they dated from 1992 to 1998. “I found her truthful and maintain no animus toward her,” he wrote. But he did not corroborate her account of an assault by Judge Kavanaugh and challenged other elements of her testimony. “During our time dating, Dr. Ford never brought up anything regarding her experience as a victim of sexual assault, harassment, or misconduct,” he wrote. Dr. Blasey has already said that she did not tell anyone about the experience until discussing it in 2002 with the man who is now her husband and later with a therapist in 2012. Many victims of sexual assault do not bring up their experiences for years after the events. Mr. Merrick took issue with Dr. Blasey’s professed fear of flying and of confined spaces, noting that they once traveled around the Hawaiian islands in a propeller plane. He also wrote that they broke up “once I discovered that Dr. Ford was unfaithful” and that she continued to use a credit card they shared nearly a year before he took her off the account. “When confronted, Dr. Ford said she did not use the card, but later admitted to the use after I threatened to involve fraud protection,” he said. None of which has resolved the main dispute, which is whether a sexual predator is about to be given a lifetime appointment to the nation’s highest court or a grave injustice has been done to a respected public servant whose reputation may be stained for life.